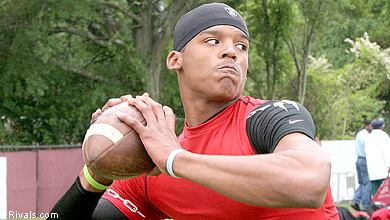 ESPN’s Adam Schefter reports that five teams have interviewed Auburn University quarterback Cam Newton this week. The Dallas Cowboys were known to have met with Newton, but that list has expanded to include the Dolphins, 49ers, Seahawks, and Titans. Peter King of Sports Illustrated adds the Panthers to that list, as well. More teams are expected to include Newton among their allotted 60 interviews during this week’s Combine, for no other reason than to get a better feel for a first-round quarterback they may end up facing twice in a season. Carolina has the number one overall pick in the 2011 NFL Draft.